October 5, 2015 By This post may contain affiliate links. Grab the kids and have some fun turning NABISCO Go-Paks! 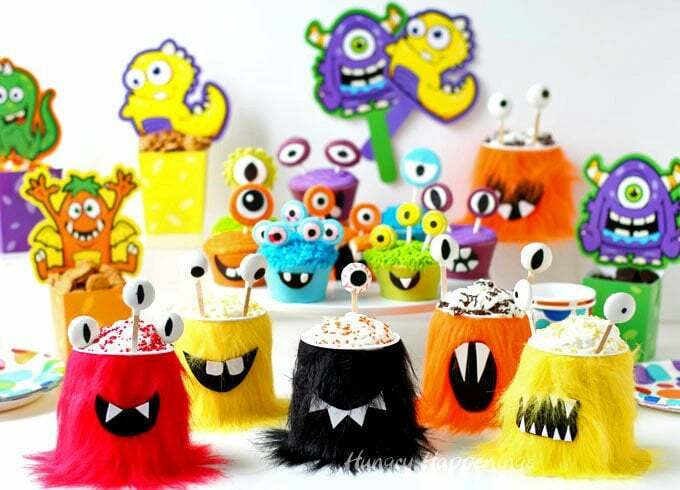 into sweet Halloween Monster Party Snack Cups. Each brightly colored furry monster has it’s belly filled with Snack Pack Pudding mousse and NABISCO cookies and is topped with a swirl of Reddi-wip and colorful sprinkles. My friends and their kids stopped by over the weekend and I surprised them with this table filled with sweet and silly monster themed treats. I have always wanted to host a monster themed Halloween party with cute and colorful monsters, but my husband would rather fill our house with creepy monsters. Remember that Zombie Party we threw a few years ago or the Dead Man’s Diner themed event? We’ve even had a movie monster party complete with a Catacomb Cinema. All were quite gruesome. 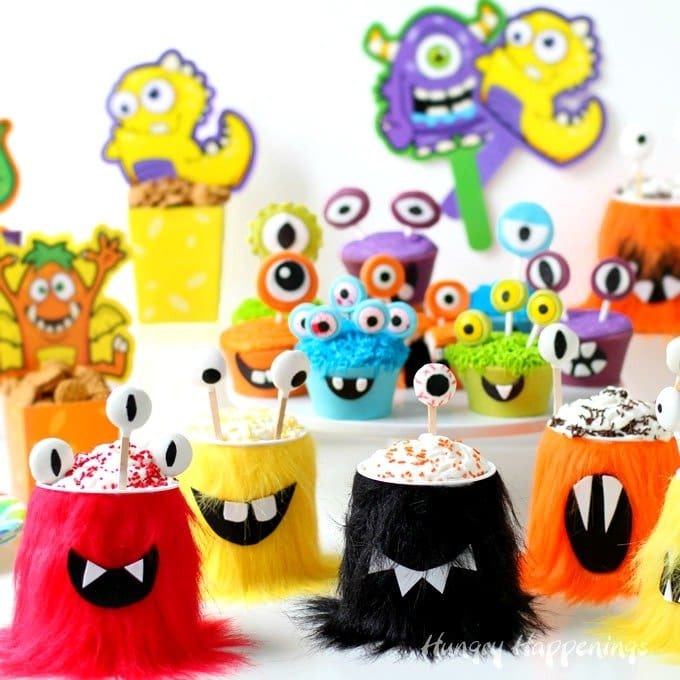 I knew the kids would prefer these silly monsters and I was so excited to get to plan the cute party that I’ve always wanted even if it was on a really small scale. 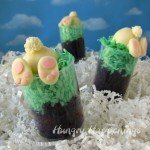 After spending hours making my Cupcake Monsters for the party I wanted to make another treat that would be really festive but much easier to make. I found some brightly colored fur and some sheets of black and white foam at the craft store and decided to get crafty and make some monster cups. 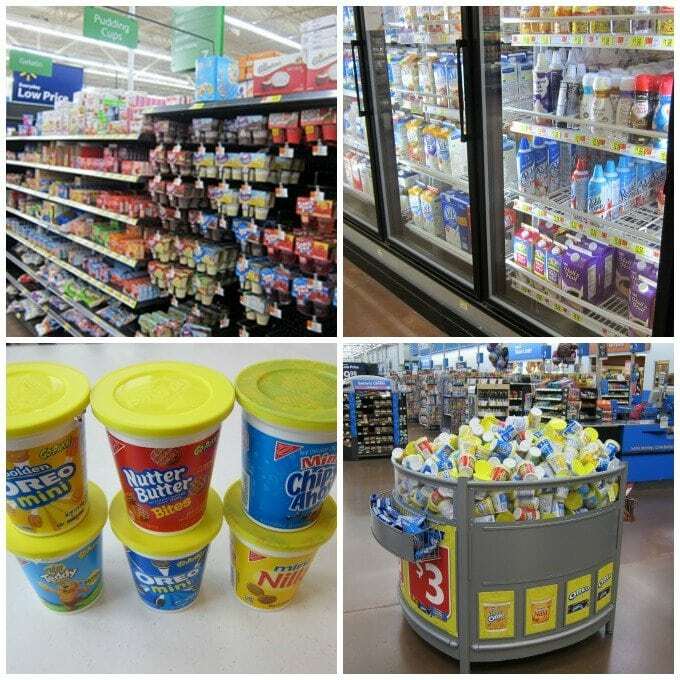 Next, I stopped by Walmart to grab some NABISCO Go-Paks! which were the perfect base for my monsters. 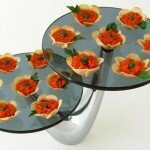 They are sturdy plastic cups filled with cookies, but have plenty of room to add other ingredients. I chose to make mousse using Snack Pack Pudding , Reddi-wip, and colored candy melts to fill the bellies of my monsters. 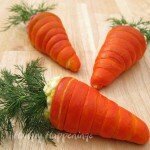 This Halloween craft is so easy to make. Start by emptying and wiping out the cups. Put the cookies aside for use later. Then cut 4 inch by 11 inch pieces of colorful fur, then wrap the fur around the cups.Use double stick tape to attach the fur to the cups, that way you can easily remove the fur to use again later. Cut out black mouths and white teeth out of the foam sheets. 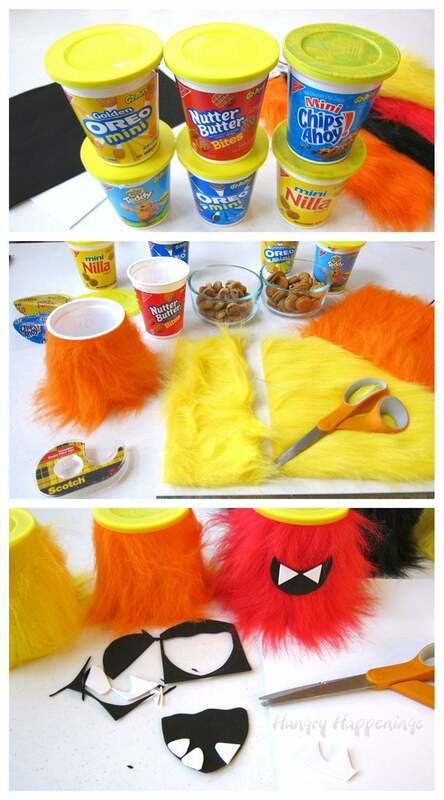 Glue the pieces together then glue the mouths onto the fur covered cups. 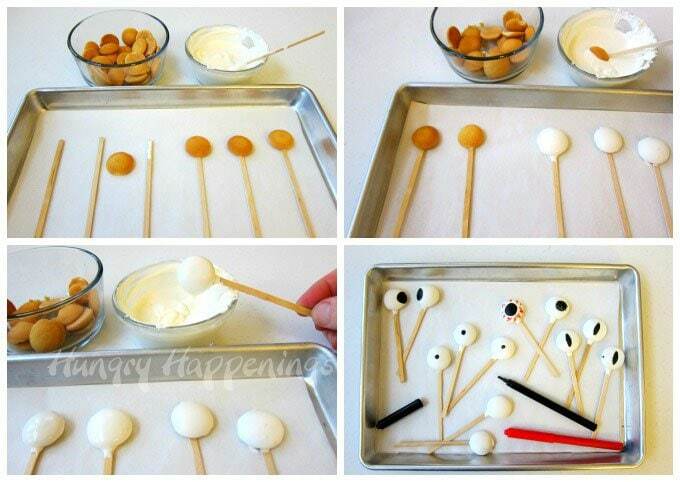 Use some of the cookies to make eye pops. I used the Mini NILLA Wafers because they have the perfect shape, but you can use the NUTTER BUTTER Bites Sandwich Cookies, the Mini OREO Chocolate Sandwich Cookies, CHIPS AHOY! Mini Chocolate Chip Cookies, or the Mini OREO Golden Sandwich Cookies, as well. 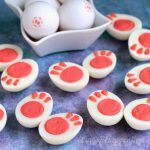 Use a dab of melted white candy melts to attach the cookies to skinny craft sticks or lollipop sticks. After the cookie is stuck firmly to the stick dip the entire cookie in the candy melts, allowing the excess to drip off, then set on a parchment paper lined baking sheet. Pop the cookies in the freezer for 3 minutes, then remove and let sit for at least 15 minutes. Once the cookies have come to room temperature use food coloring markers to draw pupils on each cookie. Add red veins for a bloodshot effect. Before the kids arrive for your party, create colorful mousse to go in the cups. 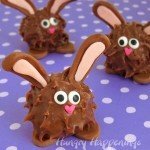 You can make the colors match the color of the fur by using colored candy melts in the mousse. For each cup, combine 2 ounces colored candy melts with 1 tablespoon of heavy whipping cream. Heat for 30 seconds on high in the microwave. Let sit in microwave for 2 minutes, then remove and stir until smooth. Heat 10 more seconds, if needed until melted. Stir this into 1 Snack Pack Pudding. Squirt enough Reddi-wip into the empty pudding container to fill it and mix that in, as well. This mousse is decadently good that even adults will love it. To make red, orange, blue, green, yellow, or purple mousse use vanilla pudding and the appropriate color candy melts. To make black mousse use chocolate pudding and black candy melts. Mix in NUTTER BUTTER Bites Sandwich Cookies for a peanut butter cup style mousse. To make gold mousse use butterscotch pudding and yellow candy melts then add Mini OREO Golden Sandwich Cookies. Just before serving layer in the mousse, cookies and Reddi-wip. Add some colored jimmies on top for an added pop of color then insert a few cookie eye pops. I filled my cups up really high so they looked good in pictures. You might want to fill them just to the top of the cups so they don’t drip down onto the fur. Setting up my party was super easy. Being my monsters were so brightly colored, I just put them on a white table up against a white wall. I found some really fun monster boxes to add to my table and filled them with lots of extra NABISCO cookies. The Monster Party Snack Cups were served with a spoon. The kids loved holding onto their furry monsters while snacking on their desserts. All the other treats, including the Cupcake Monsters, needed to be served on plates so I used some colorful polka dot plates I found at Walmart. That’s it. This party came together really quickly and my friends went nuts when they saw Halloween treats. I found everything I needed to make this fun dessert at Walmart. I was able to get all my NABISCO Go-Paks! from a display right by the registers and I stocked up because the Go-Paks! were only $1 a piece. The Reddi-wip is near the heavy whipping cream, which you’ll need for the mousse, so be sure to grab both. The Snack Pack Pudding cups were next to the boxes of pudding mix. 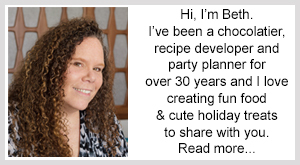 Be sure to check out more fun Snack and Go Recipe Ideas at DelicousMomentsOfJoy.com. If you were going to combine NABISCO cookies with Snack Pack Pudding what would be your favorite flavor combination? 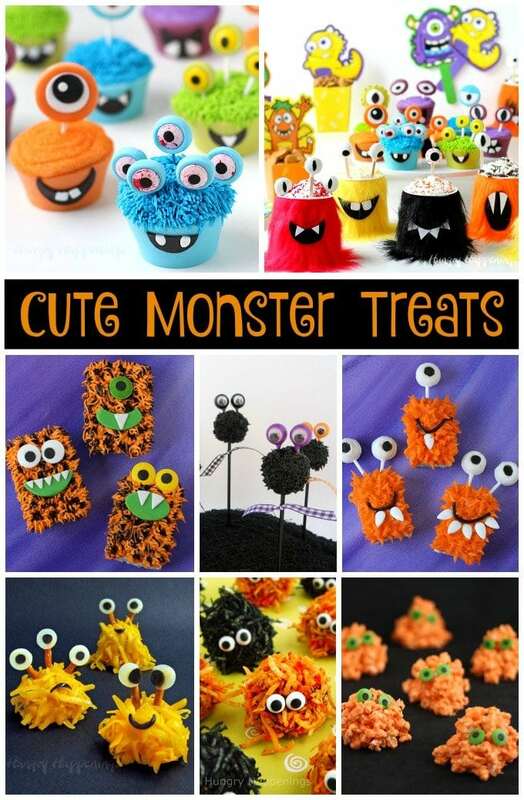 If you are hosting a monster themed Halloween party, you might like these other fun treats. BETH!!! 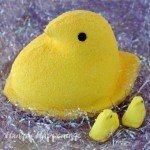 I LOVE LOVE LOVE these!! The colors, the designs! WOW! Pinning now! Thanks for double dittoing:) After the kids and adults enjoyed the mousse, I removed the fur so I can use the cup covers again next year. and shared your picture with a link back so that others could be inspired too. Your monsters turned out really cute. Thanks for sharing the inspirational link!